Compsim, "Demonstrations","knowledge management","embedded decisions","expert systems","decisions","KEEL","knowledge","decision analysis", "Flash", "Simulation", "Data Fusion", "Artificial Intelligence","UAV","swarm","swarm management","autonomous systems","collision avoidance","command and control","C2","C4ISR","medical instruments","diagnostics","prognostics","medical applications","homeland security","profiling","modeling and simulation","automotive diagnostics","Financial AI","Brokerage","data fusion","information fusion","cost effective decisions","feedback control","time-based monitoring","pre-emptive attack","frustration","Intelligent PLC","Batch Processing", "Heuristic reasoning","Opinionizer","IoAT"
NOTE: These demonstrations utilize Adobe / Macromedia Flash Animations. If you find you may be having trouble running these animations you may need to adjust the Flash settings on your computer. For information, click here. Demonstrates the intelligent behavior of two Unmanned Aerial Vehicles by executing the same behavior on the web that can be embedded in a microprocessor controlling a real UAV. A single design can be deployed in a device and on the Internet. (Note: This demo makes use of a 1024 x 768 battlefield.) From a cognitive standpoint this demo uses a slightly enhanced version of the KEEL engine demonstrated in the Command and Control Demo below (collision avoidance added). Updated to include frustration as a goal seeking technique. This is a Flash rendering of the KEEL Dynamic Graphical Language. It is an approximate rendering of what is provided within the KEEL Toolkit (Development Environment). It provides a view of how the design can be tested and evaluated. It does not, however, provide editing capabilities. 3. Swarm Leadership UAV "swarms" need to self-organize to select a leader. The swarm will need to reorganize automatically as the environment changes. This demonstration utilizes KEEL "Engines" in each UAV to self-evaluate itself and automatically determine whether it should be the leader or not. This decision is based on a set of inter-related criteria. 4. Adaptive Targeting This demonstration uses KEEL Technology to interpret information and apply auditable policies defined in the KEEL dynamic graphical language to determine if and when a target is suitable for attack by an Unmanned Combat Aerial Vehicle (UCAV). 5. UAV Surveillance Demonstration This demonstration shows a UAV tracking a vehicle. KEEL Engines handle the collision avoidance and are used to choose surveillance locations that are optimized for safety, timing, and nearness to mobile repeater sites. Contact Compsim for an explanation. for Distributed Battle Management discussions (DBM) Demonstrates 20 Unmanned Aerial Vehicles (UAVs) navigating within an area, flying to user defined target points and demonstrating swarm management behavior. (Note: This demo makes use of a 1024 x 768 battlefield.) 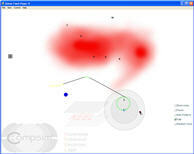 This demo is also available as an Adobe AIR application from Compsim. 9. Swarm Formations Demonstration Demonstrating Adaptive Operational Policies for swarms with controlled formations with policies that can be influenced in real time. 12. Ballistic Missile Defense Demonstrating algorithms for a Ballistic Missile Defense System with slower defensive UAVs. Work in progress on Outfielder	Models. 12. Ship Collision Warning System With human error identified as the cause for two US Navy ships colliding in 2017, this demonstration highlights the use of KEEL Technology as a means to avoid these problems in the future. 1. Diagnosing Anemia Demonstrates the use of KEEL to interpret diagnostic information from a hemotological analyzer. Explains diagnosis and why other diagnoses might be incorrect. This is a demonstration only. 2. Portable Artificial Lung Demo Pulse oximetry provides estimates of arterial oxyhemoglobin saturation (SaO2) by utilizing selected wavelengths of light to non-invasively determine the saturation of oxyhemoglobin (SpO2). This is a simple demonstration of a control system for a portable artificial lung created with the KEEL Toolkit. It dynamically adjusts to demand and could be driven by non-invasive Pulse oximetry sensors or by more invasive techniques such as integration with pacemakers. 3. Automatic Drug Dispensing Demonstration of the automatic dispensing of drugs based on blood pressure and heart rate sensors. Demonstrates the feasibility of allowing a physician to configure the drip rate of multiple drugs for real-time feedback from sensors according to a set of curves. This would allow continuous adjustment of the drip rate based on the patient's activity and changing blood pressure. 4. Patient Monitoring / Sensor Monitoring / Event Triggered Monitoring / Time-based Monitoring Demonstration allows the user to define expected reactions to medical events such as the case when individual patients metabolize drugs at different rates. Care givers can model expected reactions that are triggered by events and alarm only when unexpected events happen. 5. Chest Pain Risk Factors Demo This demonstration shows a KEEL application running on an emulation of a Windows Mobile PDA. This demonstration shows the collection of several risk factors that might be observed when a patient arrives at a hospital complaining of chest pain. This accumulation of risk factors is one of the tools used in evaluating the likelihood that there is a heart problem that needs immediate care. A KEEL engine is accumulating the individual factors to determine an overall risk factor. 1. Network Threat Policy / Monitoring This demonstration shows how a policy implemented in KEEL can interpret network statistics and determine a threat level. Configuration parameters can support adaptive sensitivity. 3. Group Behavioral Modeling This demonstration shows how KEEL Technology can be used to model the behavior of terrorist groups relative to their interest in specific targets. Target relevance is evaluated. Configuration parameters allow the importance of various factors to be adjusted. 4. Yerkes-Dodson / Eysenck Model This demonstration shows how KEEL Technology can be used to model the behavior based on the Yerkes-Dodson "law" as modified with the work of Hans Eysneck. 5. Focused Stress by Age and Population This demonstration models the susceptibility of stress on target populations by age. It might be used to model the behavior of individual or groups responding to the financial crisis, an individual's response to a mugging, or a terrorist attack at a sporting event. 1. Human versus Autonomous Driving This demonstration allows a human controlling a joystick to drive a car and compares that to autonomous driving. It exposes basic turn types that an autonomous vehicle will have to handle: turn to heading, turn to a vector, and turn to avoid an obstacle, all the time managing acceleration and deceleration. 2. Automotive Diagnostic Tree This demonstration shows KEEL Technology implemented in dynamic test manuals that adapt to the tests performed by a technician as well as external data to determine how the decision tree should be traversed. 3. Buy Sell Stock Demonstrates a system that monitors information and determines whether to buy, sell, or hold stock. Completely tunable so the user can determine the importance of information in making the final decision. Sensitivity of the system can also be tuned. 4. Creating and Executing Organizational Policies Suggests how KEEL can be used to define and execute organizational policies and establish organizational management (command and control) as a core competency of an organization. 5. Cost Effective Decision Making This demonstration shows how a simple decision can be modeled. In this case we are focusing on the selection of the most cost effective option selection. It integrates, not only "cost", but includes judgmental information like "effectiveness" and "risk". 1. KEEL Dynamic Graphical Language Limited demonstration of the dynamic graphical language. This application is used to layout the framework for a KEEL design segment. The user selects between 1) Go/NoGo Decision, 2) Option Selection, or 3) Resource Allocation. This is a limited version of the KEEL Concept Tool (one of the KEEL Toolkit set of tools). 3. A Simple KEEL Formula Demonstrates a very simple data fusion formula described using the KEEL "dynamic graphical language" and executed as a Flash function pointing to a 3-D graph surface. 4. 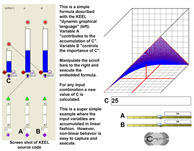 A Non-Linear KEEL Formula Demonstrates a slightly more complex non-linear formula described using the KEEL "dynamic graphical language" and executed as a Flash function pointing to a 3-D graph surface. 5. CV5 Curve Demonstrates one of the canned "dynamic" curves provided as a sample with the KEEL Toolkit. 6. Intelligent Traffic Light A common problem associated with complex systems is the fusing (or combining) of non-linear signals in the pursuit of some objective. This simple demonstration shows the integration of three signals without resorting to complex coding techniques. An "intelligent traffic intersection controller" is used to demonstrate the concept. The KEEL code for the design is also demonstrated. 7. Feedback Control Demo Performance demonstration. 8. Speed Control Demonstrates the use of a KEEL Engine to control the acceleration and deceleration rate of a motor in an efficient way. No sharp movements. 9. 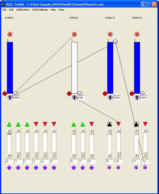 Dimmer Switch Demo in Flash MX Demonstrates the ability to create Flash MX code. Complete development documentation from Compsim walks a new user of KEEL technology through the development process of this simple application. This information can be requested from Compsim. 10. Pre-emptive Attack Shows "reasoning" with a KEEL Engine. This demonstration allows human reasoning for a specific topic (The decision for a pre-emptive attack) to be explored in a manner that can be understood beyond what can be accomplished with the human written or verbal language. 11. In Search of Frustration Demonstrates the use of a KEEL Engine in a simulation of frustration that might be used in electronic games where there is a need to depict realistic frustration by animated figures in the game. "Serious Games" are often used to simulate realistic situations where frustration may come into play. This demonstration allows the user to stimulate events and observe the frustration level increasing and decreasing. Compsim has prepared a white paper titled "Should Computers Get Frustrated?" that discusses the frustration model in more detail and addresses its use in control applications. Contact Compsim directly for a copy. 12. Intelligent Programmable Logic Controller (PLC) This demonstration provides supplemental information for ISA 2005 Presentation showing the ability to utilize KEEL Technology to extend the capabilities of conventional PLCs to incorporate human-like reasoning. This demonstration was provided at the 2005 ISA show in Chicago. 13. Heuristic Reasoning in Batch Processing Systems This demonstration provides supplemental information for the ISA 2005 Presentation showing the ability to utilize KEEL Technology to automate judgmental decisions commonly performed by humans in batch processing systems. This demonstration was provided at the 2005 ISA show in Chicago. 14. 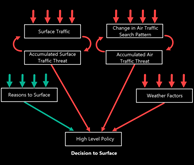 Balanced Rules This demonstrates a hypothesis for controlling the interpretation of "reasons" embedded in a policy for controlling the behavior of autonomous systems. 15. Human vs. Machine A little game to highlight the challenge for humans when competing against KEEL-based machines. 16. Complete Development Cycle Overview of a complete development cycle with videos and demonstrations from Concept, to Development, to Simulation, to Refinement and Expansion, to full Simulation with a Configurable Operational Policy. All of these demonstrations have been implemented in Adobe Flash and can be viewed over the web if you have a Flash Player installed. Compsim's KEEL technology allows the same design to be deployed in a variety of languages: C, C++, Microsoft C++ .NET, Microsoft C#, Objective C, Delphi (Pascal), Java, Adobe Flash 3, Octave/MATLAB, Python, Microsoft Visual Basic 6, Visual Basic .NET, VBScript, and PLC Structured Text and others.